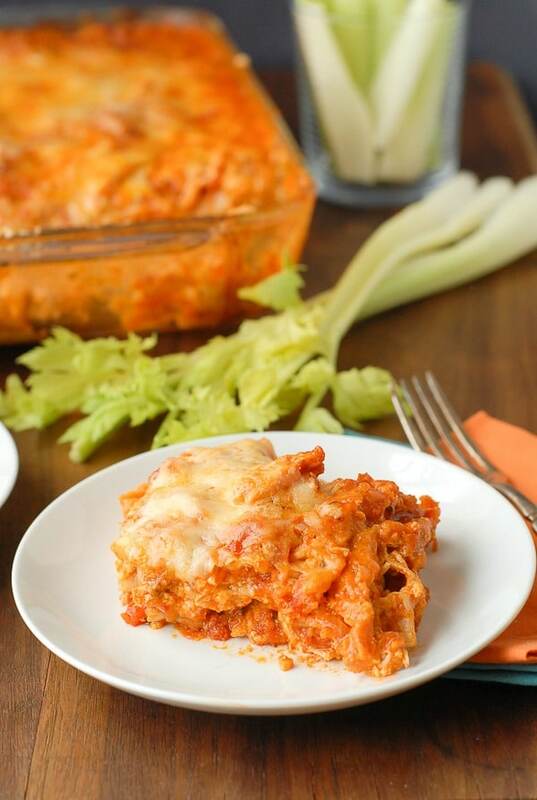 If you love Buffalo Chicken Wings you will be crazy over this Cheesy Buffalo Chicken Lasagna! All the flavors in hot wings you love, wrapped into a cheesy comfort food version. No messy fingers either! Gluten-free. 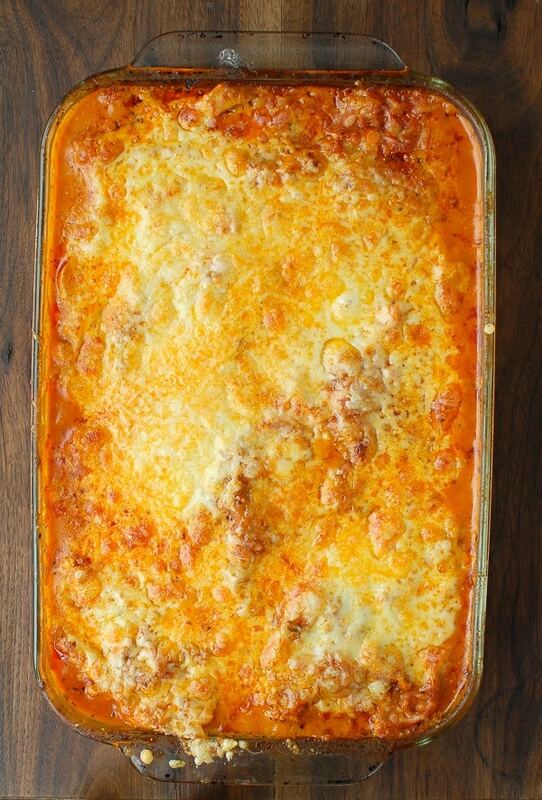 With football season in full swing and having had our first snow (yes, you read that right), the timing seems right to share some unexpected, mouthwatering comfort food in the form of Cheesy Buffalo Chicken Lasagna. I shared another lip-licking lasagna last weekend (Mexican Lasagna with Hatch Chilies) and don’t usually share something similar so quickly but the time seemed right for Buffalo Wings in a reinvented form! I have loved blue cheese for as long as I can remember. And after discovering Buffalo Wings I thought I’d died and gone to heaven. 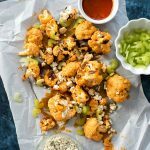 The piquant sauce slathered on the chicken wings is a perfect mixture of spicy and tangy, and when then dipped in blue cheese…..perfection! Cue mouth watering now. As much as I love ‘wings’ they don’t play well for all occasions. Football parties with people sitting on your nicely upholstered furniture; don’t think so. Around the dinner table; there aren’t enough napkins in the free world to cover that. Instead I’ve folded all the traditional flavors into a lasagna which allows the Buffalo Chicken Wing experience in a more corralled form. 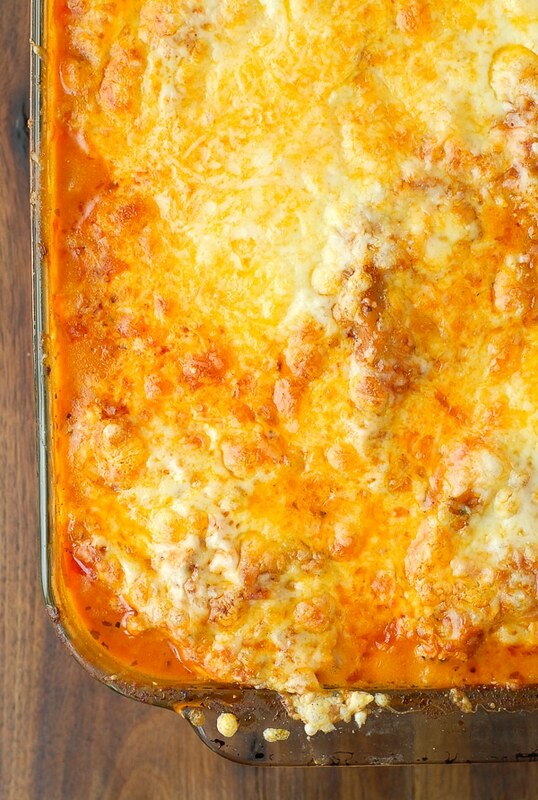 Shredded roast chicken, tangy buffalo wing sauce, blue cheese, as well as Monterey Jack and Mild Cheddar deliver the ooey-gooey cheesy quality of lasagna we all love. I really can’t think of a better combination of flavors and textures, can you? AND it’s very easy to put together! The noodles do not need to be pre-boiled either (I have a secret tip to bypass that step included in the recipe). What are you waiting for?! 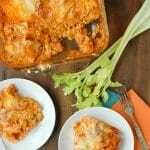 A favorite football or party food, Buffalo Chicken Wings, reinvented in an easy to prepare lasagna! 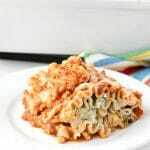 Gluten-free or gluten lasagna noodles may be used and do not have to be pre-boiled before layering together and baking the lasagna.A note about Buffalo Wing sauce: I recommend opting for a medium heat sauce. Many of the sauces rated 'hot' are miserably hot making for a painful eating experience. Medium sauces still are hot but allow tasting the rest of the flavors in the lasagna too! Additional hot wing sauce can always be added to a prepared serving if a diner really wants it searing hot! Preheat oven to 375 degrees. Combine the grated mild cheddar and Monterey jack cheeses in a mixing bowl; set aside. In a large skillet heat the oil over high heat and add onions. Cook while stirring until onions are translucent. Reduce heat to medium-high and add Marinara sauce and buffalo wing sauce. Stir to combine; add the shredded chicken. Bring the mixture to a low boil, reduce heat to low and simmer for 5 minutes to allow the flavors to meld. Spoon one third of the sauce mixture into the bottom of 13 x 9 x 3 inch baking pan. Spread to evenly cover the bottom of the baking dish. On top of the sauce, place four uncooked lasagna noodles (there will be space between them). Spread half of the ricotta cheese on the noodles. Sprinkle evenly with 1 cup of the grated cheese, followed by 4-ounces (1 container) of blue cheese crumbles. Place last four noodles on top of layered lasagna and cover with the remaining one third of the sauce. Gently pour the 1/4 cup hot water around the inside edges of the baking dish (between the noodles and inside edge of the baking dish). Note: if the water pools at the top of the lasagna, insert a dining knife or spatula between the edge of the lasagna and pan and pull gently toward the lasagna to open a space for the water to run down the sides of the pan. Smooth lasagna back into place. Cover tightly with two pieces of heavy duty foil. Bake for 50 minutes. Remove the lasagna from oven and remove the foil. Cover with the remaining grated cheese and place back in the oven, uncovered, to cook an additional 10 minutes. Oh my goodness! This is delicious! 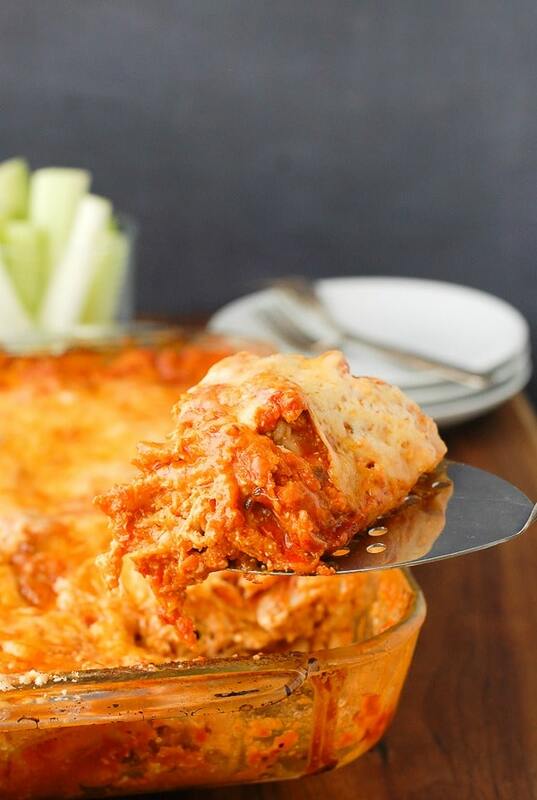 A crossover between lasagna and enchiladas. Wow. This looks yummy! I have to make this asap! Thanks for the recipe! That looks so amazing! That cheese is making my mouth water! Delicious! Hi, I am curious as to how the marinara sauce tastes in this dish. I am not a huge fan of marinara, but I love buffalo sauce. Is the marinara just for filler, or does the dish have a strong marinara taste to it? Hi I was wondering if this did can be frozen? Do you think it would work to substitue 8 oz of ranch for the 8 oz of blue cheese? I can tolerate blue cheese, but really prefer ranch and this is right up my alley! Hi Leanne! Unfortunately you would we swapping 8 ounces of a solid cheese with 8 ounces of a liquid salad dressing so they really aren’t interchangeable to assure the lasagna would still come out in solid form just with a flavor difference. If you don’t care for the flavor of blue cheese I would suggest substituting it for 8 ounces of either the cheddar or jack cheese (or a mix) to to make 8 ounces and drizzle ranch on the top when you serve it maybe. I will add the blue cheese is not overwhelming in the lasagna. You can taste it and the lasagna does taste like hot wings but it’s not as strong as dipping hot wings in blue cheese dressing for instance. Hope this helps! Sounds yummy! Are the lasagna noodles the oven ready noodles, or the regular ones? By ‘oven ready’ do you mean noodles that don’t have to be precooked Melanie? These are regular noodles BUT I have a sly trick that provides I never precook the noodles. If you read the recipe, there is a step at the end of pouring 1/4 cup of hot water around the edge of the lasagna before it’s sealed with two layers of foil. That allows the noodles to cook perfectly every time without pre-boiling them! I’m all for making it as easy as possible. I was not impressed with the first snow on Friday, too soon! 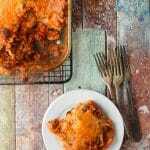 I am totally impressed with this buffalo chicken lasagna! Perfect for serving during a football game! It was not an impressive snow, I agree. However maybe starting slow is good for the summer to winter transition! Strange to be back in the mid 80’s this week, isn’t it? Of the two, I am with you on the lasagna as the winner! I love this combo. Thanks for sharing. Oh, my comfort food! Great recipe! I wish I could reach through the screen and grab a huge slice. This sounds fantastic! Seriously, I don’t think this dish could get any better!! I have to agree Beth! I love this! Perfect football food! I think so too Lisa! Easy to make, feeds a crowd; what else could you want?! Such a great recipe for football season! I am a huge buffalo sauce fan. Will definitely try this out. Looks delicious! 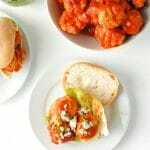 I don’t eat buffalo sauce dishes often but I sure love them when I do! This is so easy to make too; love that. Now that looks positively delicious Toni, I do love my buffalo chicken and making it into Lasagna form is just brilliant! So glad you like it Dennis! 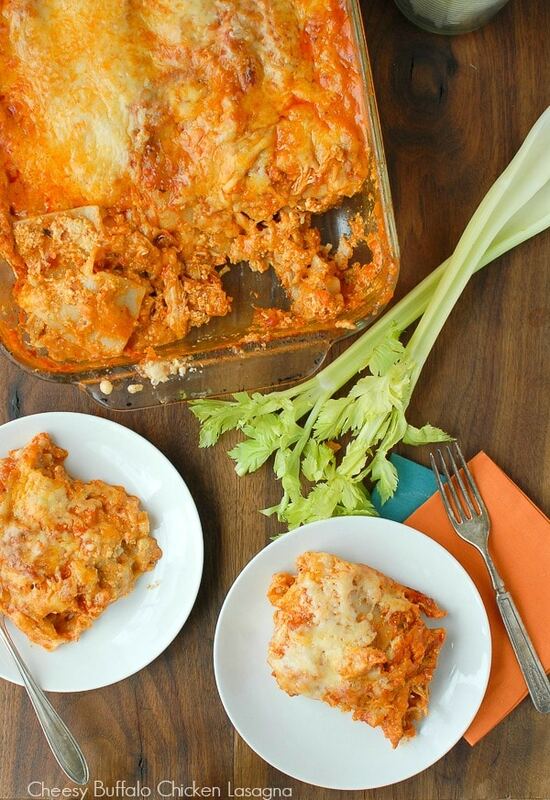 It really is so delicious and I love the flavors in the comfort food form of lasagna! Thanks so much for stopping by.